How KFC has dealt with a total cluck up! This week KFC stores around the UK ran out of chicken in a spectacular delivery fail. Find out which PR tactics they used to win the forgiveness of the UK’s fried chicken lovers. New chicken supplier, DHL, could not get the chicken from the warehouse to KFC stores efficiently, or well even at all during February 2018. So, there was a lot of chicken rotting away in warehouses while stores couldn’t provide hungry diners with dinner. 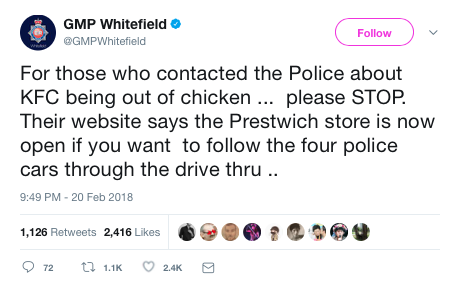 Cue chicken chaos across the UK, with some people even contacting the Police during their chicken emergencies. No, I’m not joking! 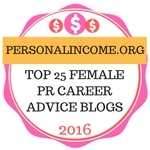 Read the article by clicking on the picture! But, it seems that an awful lot of forgiveness and accommodation has been given to KFC because of the way they carried out their crisis management. Honesty in crisis in essential. Lie and you will be caught out. KFC’s first steps were to be honest, say they have a problem, explain the extent of the problem and apologise, and it instantly made things clear from the start. Being quick off the mark on this is also key, waiting for other commentary or for events to unfold (probably not in your favour) will put you on the back foot and your apology will not be taken as sincerely. It will looked forced or that you were looking to see if you could have got away with it. It certainly won’t endear you to the people your apology is aimed at. On their website they initially put: “The chicken crossed the road, just not to our restaurants.” Followed by a fuller explanation of what was happening. 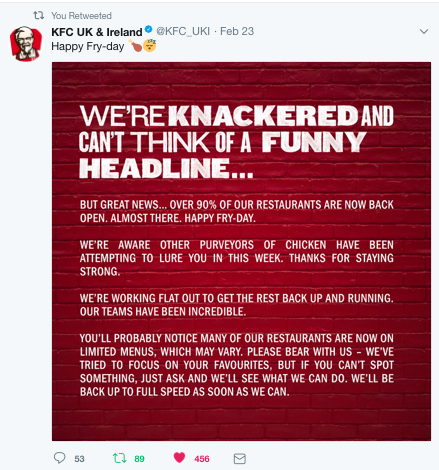 KFC disseminated their message immediately through social media channels and the UK’s press. So virtually everyone who was anyone knew about the problem quickly. Adverts were placed in popular newspapers The Sun and Metro, on February 23, apologising for the “FCK” up. The funny and to the point advert was created by Mother London, the fast-food chain’s UK creative agency since last year. They also changed their website into an important updates page with all the sites you can and can’t chicken from. So fans of the brand can find out if their local chicken shop is open or not. Now the thing that really swung the situation favourably for KFC was the great use of humour in the messages they communicated. 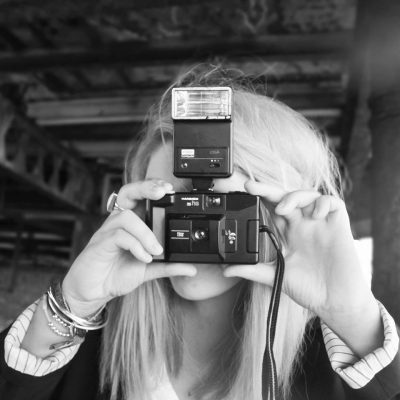 It was the right balance of funny, without trying to hard or being inappropriate. Humour wouldn’t work in every crisis. But, in one where there’s no danger or life or death situation, a bit of comedy can do a lot of good. 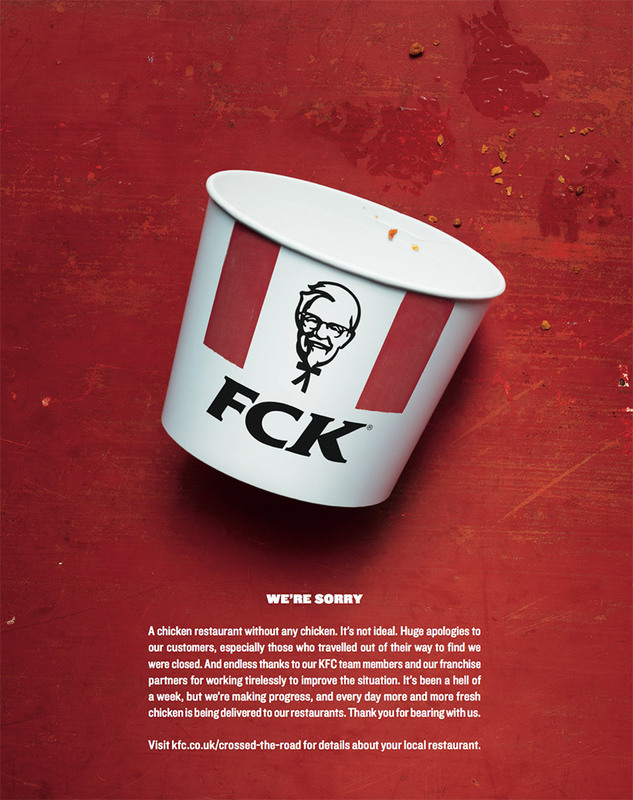 They also did a variation on the initials of KFC to make it look like a swear word with the vowel removed for the print advert and for use online. At the end of the week they did another update on Twitter which should keep hungry chicken fans appeased over the weekend. This constant communication did wonders for resolving the situation. There’s no doubt that the skilled management of the situation will propel KFC and Mother London into the pathway to win many best crisis management awards. It’s just too big and too good not to get formal recognition. What could KFC have done better? Ok, so they have dealt with this crisis beautifully but, I do think they have one failing. And that’s neglecting the chicken in the warehouses. Could something have been done to stop that being wasted? Now I have no idea how much chicken was wasted and what was viable but, it’s good to think about what could have been done to stop food waste and elevate KFC’s response even more. Could the chicken have been picked up by foodbanks, distributed to local organisations around the warehouse or converted into another product like pet food? With all the food banks in the UK why was the chicken left to rot? For me, the icing on the cake would have been the responsible management of that chicken that was wasted and will now be in landfill. Regardless it’s undeniable that this is a masterclass in how to deal with a PR crisis that could have been much, much worse if it hadn’t been handled so well. What do you think about KFC’s cluck up? Got an opinion? I’d love to hear your thoughts on the crisis and how it was handled! That’s exactly my point. Something should have been done with that chicken. Doesn’t matter what it was, just anything so it wasn’t wasted. That’s a good point, maybe they did and that’s where it went even further wrong. Crisis is tricky. It is really hard to handle and to get the tone right while dealing with endless requests and people weighing in with their opinion. No wonder their last message was ‘We’re knackered and can’t think of anything funny to say’! 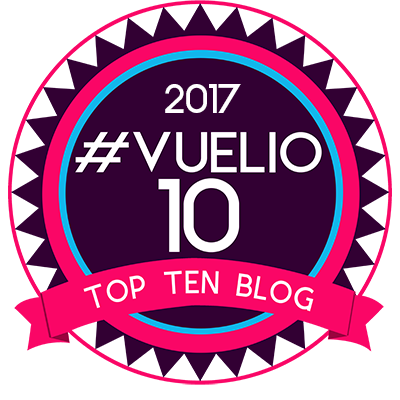 Behind the scenes it’s very demanding – it must of been one hell of a week for that team! Yes, they do, a couple of my friends have done that bin skimming. They go around the big companies like Tesco, Coop etc and the amount of food they’ve rescued is mad. However, it’s also on the cusp of going off and from a bin. I struggle with the waste the most. I wish we weren’t wasting so much. I know food has strict health and hygiene rules so it’s a real tricky situation! I reckon you must be right and it was a part of it. By the time they knew they wouldn’t get it out it must have been either left out of the freezer for too long or it was close to its best before date. Such a shame! I also debate with bin skimming,, I don’t know if I could do it, but then if I was starving, I probably would. I do think something should be done with the amount of food waste we have in this country, we are a family who tries not to waste anything, helps we have a dog, I must admit. It’s difficult. When I see the food she ‘liberates’ from the bin, fully packaged and nothing wrong with it- that I find that really difficult. There’s a lot of homeless people in the city centre that it could be distributed to. I think it’s a small part of the much bigger issue. We all definitely have a responsibility. It’s such an interesting topic. Ah, I’d love a dog! I bet that does help!